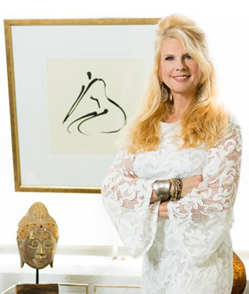 Intuitive By Design, Anna Maria Capocelli Kinberg is an award winning Intuitive Interior Designer & Feng Shui Consultant that has been creating beautiful spaces for over 15 years. Her scope of work has been residential and commercial spaces throughout Connecticut, Westchester, Manhattan, Florida, California, South Hampton, & Park City Utah. Anna Maria realized early on that the energy of every person and their space—in combination with the details of Interior Design—has a story which sets the stage to create a harmonious and nurturing environment for her client’s to inhabit. Our goal is to provide creative and beautiful interiors by bringing together the inspiration and imagination that not only supports their visual environment, also intuitively supports their emotional and spiritual lifestyle. Guided by her inherent gift of connecting with and interpreting her client’s desires, Anna Maria transforms her client’s aspirations for their living space into environments where they go to fuel and recharge to be extraordinary in all that they do. Whether the design is Contemporary, Traditional, or Modern it is paramount that functionality is first and foremost in today’s modern lifestyle.